Why do we worship Allah(God)? How do we worship Allah? How do we perfect this worship? And what are the levels of worshiping Him? Shaykh Yasir Qadhi answers these questions by taking us on a journey of the very purpose of our existence, the worship of Allah jalla jalaa lahu. In this lecture Abdurraheem Green addresses the age-old question, "Does God Exist ?" The lectures begins by defining what a God is and continues to explore why it is common sense to believe in a Creator. He then brings forth the evidences from the Muslim Holy Scripture, The Quran, to detail the existence of the one true God. Abdurraheem Green was born to British parents in Darussalam in Tanzania in 1964. He was educated at a famous Roman Catholic Monastic School called Ampleforth College. He went on to study History in the London Univerity before he embraced the religion and became a well known caller to Islam. Abdurraheem spent many years at Speakers' Corner in Hyde park, where he made his name as an inspirational orator. He has been delivering talks nationwide including universities during this time, and also on international platforms, such as the Peace Conference in Mumbai. He is a regular on Peace TV with many of his lectures widely watched on YouTube. Tells the truth about Christianity. How the gospels are unreliable. Audience member shouts at him a few times. Abdur Raheem Green was born in Dar-es-salaam in Tanzania to British parents, Green's father (born in England), Gavin Green, was a colonial administrator in the then extant British Empire. At an early age he moved back to the UK with his parents. His mother is of original Polish origin. At the age of 10 he attended a Roman Catholic Monastic boarding school at Gilling Castle and then went onto Ampleforth College and went on to study history in the London University. However, he left his education unfinished in an effort to devote himself to Islamic works. He became dissatisfied with Christianity at the age of 8, with it not making sense to him. Green researched and practiced many religions, including Buddhism (for 3 years) before embracing Islam. Whilst in Britain his father got a job in 1976 working for Barclays Bank International and was subsequently sent to Cairo, Egypt, to set up a branch of the Bank there. His study of the Noble Qur'an immediately attracted him to Islam and he embraced Islam in 1988. He has been a Daw'ah practitioner in Britain since then. Green now works in the London Central Mosque and Islamic Cultural Centre as the Visits and English Dawa Co-ordinator. 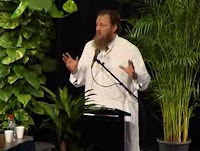 Green is seen akin to lecturers such as Dr. Zakir Naik, Dr. Bilal Philips, Khalid Yasin and Yvonne Ridley, doing many lectures on Islam worldwide and also in London's famous Hyde Park, Speakers Corner.